The Hotel Queen Mary  A "Ship within A Ship". We believe that is desirable to allow hotel guests to experience this full range of services and amenities that existed on the Queen Mary in her prime sea-going days. To create the great ocean liner experience for guests, a private area that is minimally disturbed by the tourist-attraction is necessary. We call this concept creating "a ship within a ship". But how could one just close off a large part of the ship in this way? While in service the three classes of service were built to be self-contained. The logistical arrangements are largely forgotten today, but by studying the way the Queen Mary was designed and built perhaps we can put this scheme to work for our business purposes in future. Note: To see why the hotel is now simply three decks of cabins, read our article on "How it got to be the way it is today." Parts of the necessary arrangements are already in place, but though the current hotel decks (Main, A and B decks) are largely isolated from the lower deck museum areas and the upper decks' tourist attraction and catering facilities, these hotel decks are simply three decks of cabins. There are no significant passenger amenities in operation on these decks. By these we mean lounges, bars, smoking rooms, writing rooms. The ship within a ship program needs to have public rooms. The grandest public rooms for Queen Mary passengers were the first class public rooms primarily located on Promenade deck. But what remains of these amenities today have been turned over to banqueting and catering services. There would be another problem with using these rooms for hotel guests only, as Promenade deck also must be allowed to function as a prime retail and tourist attraction area. The first class dining room is too large to reserve for use by hotel guests on a regular basis. It can seat 800 in one sitting. Since hotel guests are not any longer a captive audience on the Queen Mary since she is permanently moored, it is unlikely so large a room would be required for a "hotel guests only" section of the ship. The first class swimming pool and associated Turkish-baths complex can and should be restored to working order, but the first class pool is a major feature on the guided tour and is likely to remain so due to its popularity on these tours. It is unlikely that hotel guest swimmers will enjoy being gawked at by groups of 30 tourists every 15 minutes. Fortunately another complete set of passenger amenities existed on the ship. These were the second class public rooms. Arranged around a grand staircase and elevators in the after portion of the ship on eight decks their scale and caliber of design was one of the distinguishing features of the Queen Mary -- one that placed her well ahead of her rival the French liner "Normandie". These rooms included a handsome smoking room on Promenade deck, a smart main lounge, library and writing room on Main deck, a secondary lounge on A deck, a spacious dining room on C deck (now called R deck), and an indoor swimming pool that was noted for its outstanding design and is featured in one of the definitive text books on the art deco period, plus a gymnasium on original F deck (now called E deck). Originally class barriers separated the aft portion of Promenade deck from the forward first class section. By simply reinstalling the barriers on Promenade deck, the entire back end of the ship can be isolated from today's tourists and reserved for hotel guests' use. Daytime tourists can still circle the exterior of Sun deck and the enclosed Promenade deck using the pre-war turnabout which was just forward of the second class barrier. But because the decks immediately beneath Promenade deck - Main, A and B and R deck- are already isolated from the attraction as hotel decks, this simply change creates the opportunity to build "a ship within a ship." Possible restoration of the pre-war turnabout on Promenade Deck. The current Hotel decks highlighted in yellow. 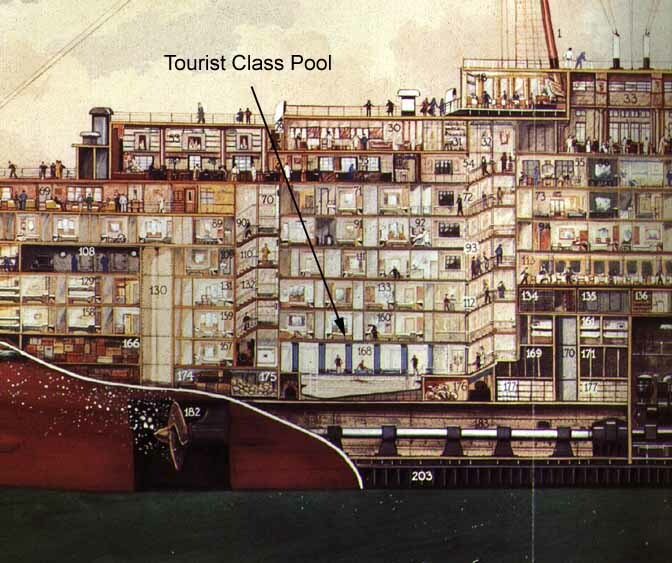 A "ship within a ship" - a side view plan of the proposed addition to the Hotel Queen Mary. Would there be any loss to the operation by this reorganization? There are significant benefits to the hotel including the creation of two entirely new business initiatives that result from these changes. These change would mean no significant loss to the tourist attraction if the program outlined in the article in this series on the attraction are implemented. •Another 50 full sized cabins might be created on the starboard side of current C deck. 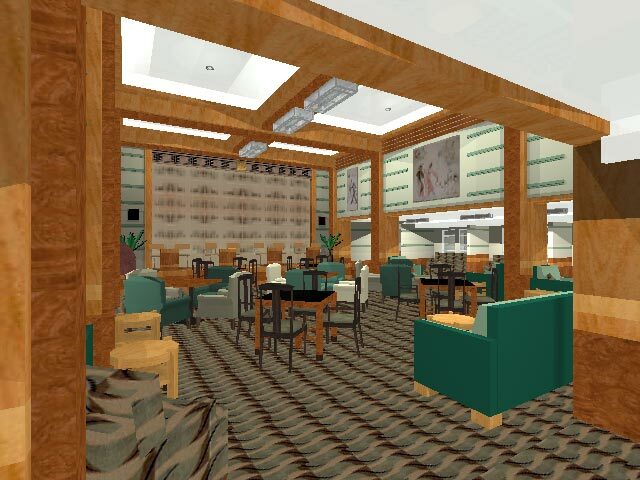 •The former second class lounge area on Main deck becomes the social center both for hotel guests and members of the new social and business "Club Queen Mary." •The reinstalled second class pool and gymnasium would serve as the centerpiece for the new Queen Mary Health Spa. •The aft engine room and propeller exhibits would be shown on a fully developed guided tour of the entire lower decks. The tour would start at the bow of the ship and would exit after the propeller display is seen using the currently existing means of egress on D deck. The layout below illustrates our proposed restoration of the Second Class Main Lounge and surrounding area including the second class library and writing room as well as the children's playroom and a service area labeled the scullery. We see this second class main lounge area on Main Deck as the primary social center of the "private reserve" we call "a ship within a ship." 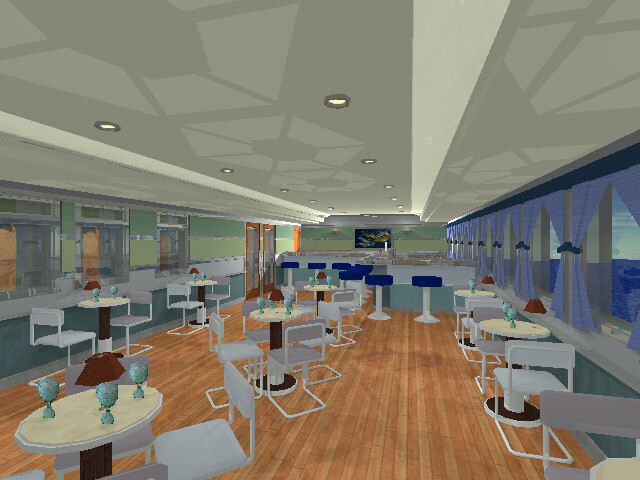 Note that we have recreated the post war "Mermaid Bar" in the enclosed promenade area adjacent to the restored lounge. It was originally located on Promenade Deck one deck above - in virtually the same location. The above rendering by Jeff Taylor shows how a reconstructed Mermaid Bar might look. Some of these and other areas we see integrated into the "ship within a ship" are covered in detail in earlier articles listed below. Current curatorial thinking for historic sites puts museum displays and information center features adjacent to but not intruding on the historic structure itself. The idea is that you come to see the historic site as close as possible to its original condition -- not to see displays about the historic site. If the management of the Queen Mary instituted this approach, the museum and visitors' information center would not be on the ship. This change in presentation philosophy would free up the area that housed the second class pool and gymnasium for reconstruction. Reinstalling this second class pool and gymnasium might not be as difficult a job as it might at first appear to be. The boundaries of the pool basin are still visible at the ceiling level on current "F" deck and there is no reason to believe that the structures that supported the basin's weight when filled with water were ever removed. So the structural work required for rebuilding the pool might be not be great or expensive. The design of the pool is fully documented and elements of its decor still survive. Two of the three Cameron Baillie etched glass panels of fish from the pool are currently on display on Promenade deck in the "Art of the Queen Mary" exhibit on Promenade deck. If both elevators around the second class main staircase were put back in service and the staircase again extended down to current E deck as it was originally, the pool and gymnasium would be conveniently accessible to hotel guests. If these facilities were combined with a restored second class lounge, the adjacent second class library and writing room as well as the second class smoking room on Promenade deck, (all adjacent to the second class grand staircase and elevators), then hotel guests would have a "ship within a ship" - a magnificent private "world" undisturbed by the intrusion of daytime tourists. Non-hotel guest "Queen Mary Club" members might be invited to use the wharf-side entrance which already exists at the stern of the ship (for the current museum) to come on board to enjoy the benefits of the elegant hotel-reserved lounge, dining room and athletic facilities in this very private part of the ship. Sideview of the ship within a ship concept. Click on the image to expand it. Recreating the great passenger experience for hotel guests on the Queen Mary is a very "do-able" project. Certainly it is far easier to achieve and less costly than the two recreations of the ship Titanic currently in planning. It is also likely to be more authentic. The greatest challenge is allowing ourselves to look a bit beyond the now converted ship back to the glorious liner. By correcting some of the mistakes made since 1967 we can recapture the great Queen Mary experience for all.